John Deere is to launch its new 2R Series compact tractors to the UK and Irish markets at SALTEX 2016 in November. The company’s joint display with regional dealers Farol, Henton & Chattell and Tallis Amos Group (TAG) will feature, for the first time at a UK show, a 2036R compact model alongside a new XUV 590i Gator utility vehicle and new walk-behind rotary mowers. The 26hp 2026R and 36hp 2036R compact tractors feature new ground-up designs and a host of innovative features. The 2026R is ideal for operating in more confined spaces, while the 2036R has a wider footprint and longer wheelbase, combined with increased tractor weight for better stability. Both models are designed for comfort and reduced operator fatigue during long working days, with ergonomic controls, a tiltable steering wheel and cruise control. The 2036R also offers a premium air suspension seat and the industry exclusive CommandCut mower deck lift system. Both tractors are also available with a choice of open operator station or cab, offering good all-round visibility. 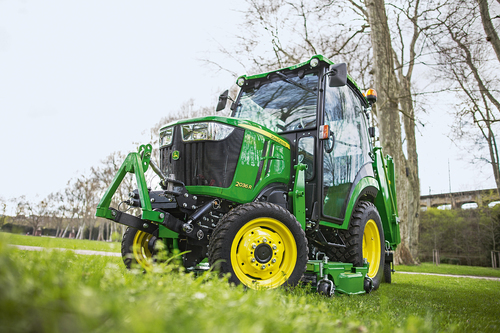 The 2R Series tractors improve productivity through several easy-to-use features. The all-new CommandCut system for the mid-mounted rotary mower deck on the 2036R provides quick and accurate cutting height adjustment with the turn of a dial and the nudge of a lever. Both models also have Twin Touch foot controls, which simplify the selection of speed and direction of travel. An eThrottle feature allows the machine to automatically increase or decrease engine speed as required, while standard cruise control keeps ground speed consistent. Fully independent ptos allow front, mid and rear-mounted implements to be attached at the same time and combined in different ways, to increase the equipment’s versatility. AutoConnect mid-mounted mower decks are easy to attach and remove for higher productivity, while new QuikAttach 120R and 220R front loaders are designed specifically for the 2R Series, for maximum performance. Additional benefits are provided by the new John Deere designed and manufactured front hitch options. The 2036R also features an electric lock-out valve so that the operator can easily lock the hitch in the transport position with the flick of a switch from the tractor seat. Intuitive maintenance features include extended fluid service intervals and improved access to the engine compartment. Standard service indicators alert the operator when maintenance is required, such as when the air filter needs to be cleaned or replaced. In addition, the engine oil dipstick has been moved to a more convenient location, making it easier for operators to check oil levels. Onboard diagnostics and Service Advisor connectivity also allow service technicians to quickly and easily monitor the health of the machines. The new 2036R Series compact tractor will be shown at SALTEX alongside one of the latest models from John Deere’s ever growing range of Gator crossover 4x4 utility vehicles. These include the petrol engined XUV 590i and XUV 590i S4 four-passenger machines, and the mid-size XUV 560. This model is aimed at those looking for a more affordable 4x4 UTV, but with the same levels of comfort and versatility expected of the popular and well-established Gator range.